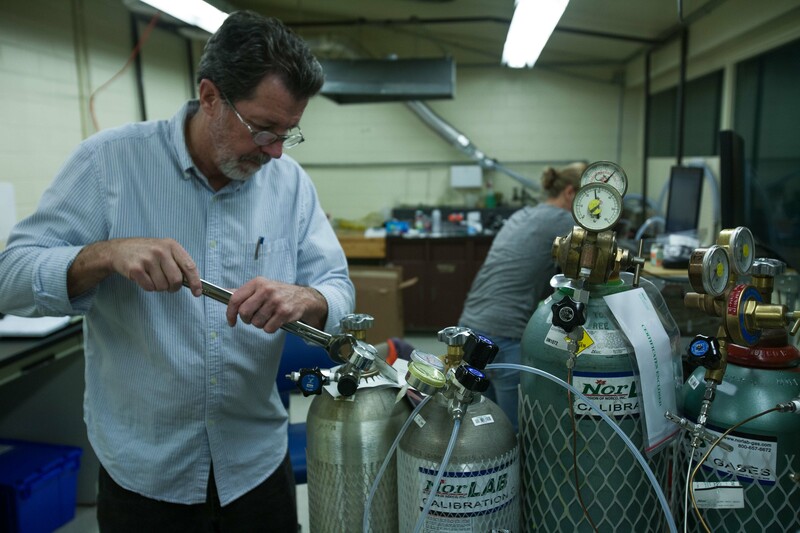 On October 1, top chemistry researchers from around the country came to Missoula, Montana, to light stuff on fire. They converged at an old building that looked like a mad scientist’s warehouse. Inside, they helped each other set up millions of dollars worth of instruments. Wind tunnels weaved in and out of the walls, and a rickety elevator ferried researchers to the top of a giant smoke funnel. 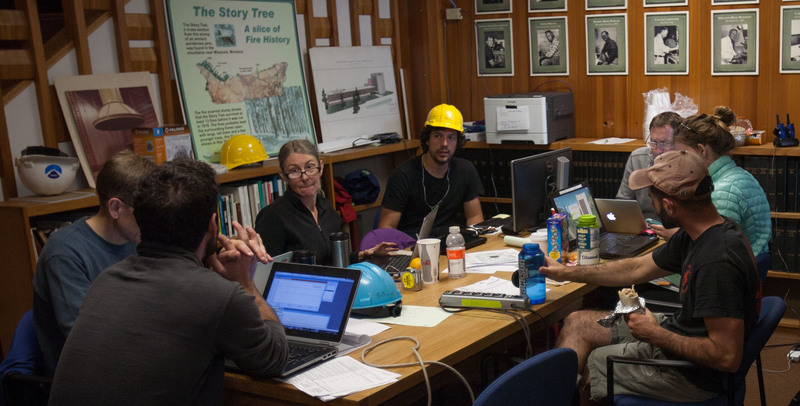 These scientists were kicking off a multi-year mission called FIREX—Fire Influence on Regional and Global Environments Experiment, to better understand the air quality and climate effects of fire—in the controlled environment of the Forest Service’s Rocky Mountain Research Station Fire Sciences Laboratory (Fire Lab). “Wildfires are one of the larger remaining issues for air quality in the U.S.,” said NOAA scientist Jim Roberts, principal investigator in FIREX. “Fires are probably the least known of the three major influences on the atmosphere,” added Bob Yokelson, a chemist at the University of Montana and one of the lead investigators for FIREX along with Roberts and Carsten Warneke, a researcher with CIRES and NOAA. Fire likely wields an equal influence to naturally occurring emissions from vegetation and anthropogenic emissions, including cars and factories. Jim Roberts, NOAA. PHOTO BY HENRY WOROBEC. Team FIREX used the facility for six weeks to conduct preliminary research for a 2018 aircraft campaign in which the instruments and researchers will go airborne to sample from real fire throughout the Northwestern United States. “What I think is neat about what we’re doing is we’re using hi-tech instruments to measure real things in the real world,” said Tara Yacovitch of Aerodyne Research—one of the many institutions that joined FIREX. In a hard hat and yellow vest, a burn technician carried bags of ponderosa pine branches through double doors and into the largest climate controlled combustion chamber and wind tunnel facility in the world. Beneath a giant retractable flue, a chicken wire cage rested atop cinder blocks. The technician placed the branches in the cage and stepped back behind a laptop. An alarm sounded, and a heating coil ignited the litter of branches. While a few scientists looked on from observation rooms, the majority focused on their monitors and instruments. This routine took place two to five times a day, six or seven days a week, for six weeks. Over a hundred fire experiments covered variables spanning from the type and intensity of the fire to different tree species and their different parts. Common among all fires were the processes of flaming and smoldering. Flaming is most prominent at the beginning of most fires and is characterized by bright flames and darker smoke, while smoldering is often a later stage and indicated by white smoke. Ignition. PHOTO BY HENRY WOROBEC. The relationship described by Yokelson can be seen in the correlation of spikes and dips in data graphs of all the different research focuses at FIREX. To get a clear sense of this, one can look at the simple variation between carbon dioxide and carbon monoxide emissions. At the beginning of the burn, when the fire is predominantly flaming, carbon dioxide spikes. As the fire runs its course and moves into the smoldering phase, the carbon dioxide subsides and carbon monoxide rises. 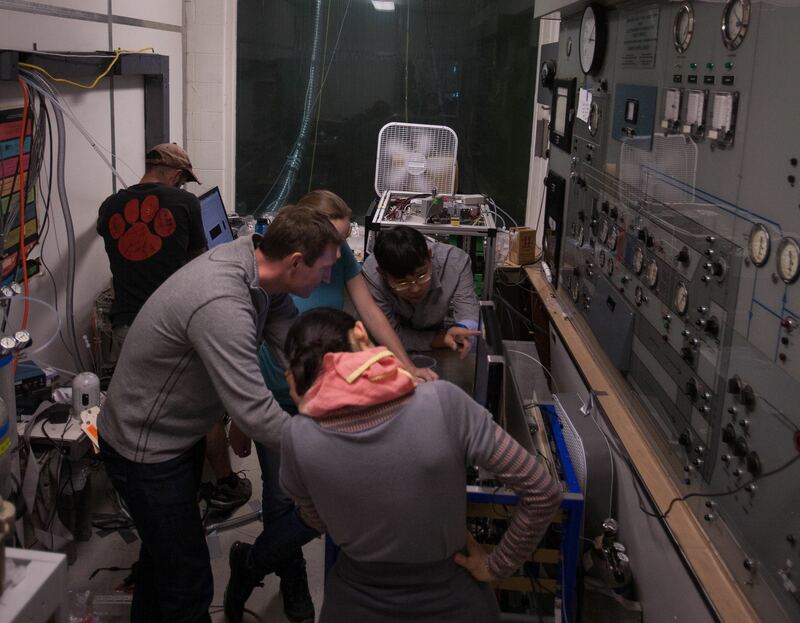 Some of the emissions traveled to a dorm room-sized “smog chamber,” where 80 ultraviolet lights synthesized the aging effects created by the sun. Watching the data come in. PHOTO BY HENRY WOROBEC. Back indoors, in a room packed with computers showing fluttering numbers and dancing graphs, halogen ceiling lights shone on columns of two-foot long, two inch diameter metal canisters. In a little more than a year, these will collect emission samples out of NOAA, National Center for Atmospheric Research, and NASA aircraft flying over real wildland fires. 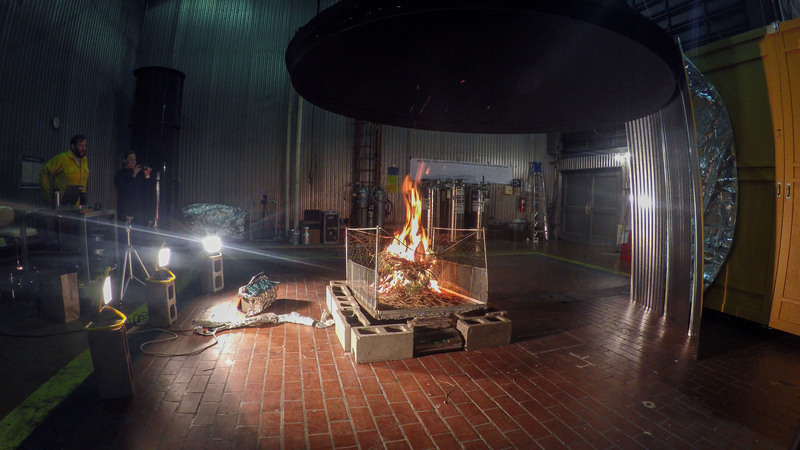 At the Fire Lab, scientists studied “aging effects” in the canisters, so they can better understand future data. Lunch and planning. Photo by Henry Worobec. More images available on the CIRES Flickr page, FIREX album.